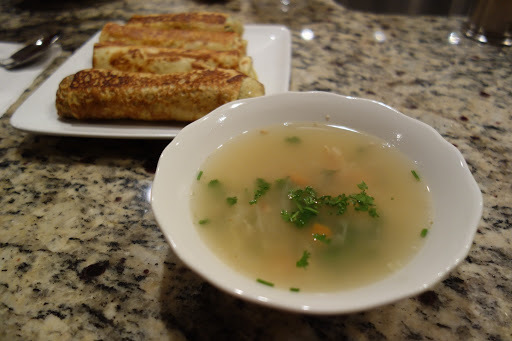 This was my first time making this traditional Ukrainian sauerkraut soup. 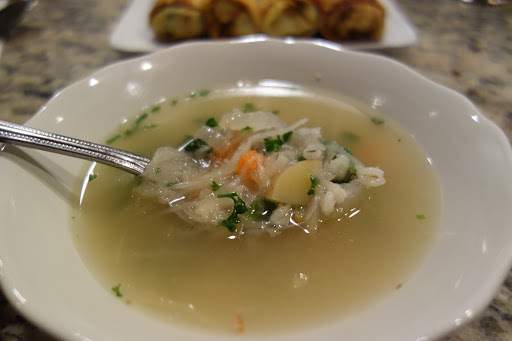 Having a strong affinity towards sour foods all my life I very seldom had the pleasure of enjoying this delicious soup once I moved out of my parents’ house. So after all these years I finally made it myself and Jerry and I enjoyed it for dinner with some spinach and beef crepes. 1. Place the beef shank in a large pot of water and bring it to a boil. Allow the meat to boil for about 10-20 minutes. Skim all the residue off the top of the water and dispose of it. Once the water looks fairly clean add in your barley and allow it to cook for about 10 minutes. 2. Meanwhile, dice up a large potato, 2 large carrots, an onion, and some bacon. Saute the onion and bacon. Add the onion, bacon, potatoes, and carrots into the soup. Allow the soup to lightly boil for about 20 minutes. 3. Now you can add the sauerkraut. Feel free to play around with the amount of sauerkraut you add to the soup. I’d say you need at least 1 16 oz. can, but if you like it more sour you can add more (make sure you add the juice from the sauerkraut as well). Once the sauerkraut is added, allow the soup to boil for another 10-20 minutes. Season with salt and pepper to taste. Serve the soup hot and garnished with some fresh parsley. This entry was posted on January 23, 2013 by natalyaperullo in Food.